I happened to find myself rereading, this weekend, the opening pages of Neelak S. Tjernagel’s biography of Dr. Robert Barnes (~1495-1540), Lutheran Martyr. Dr. Barnes was an Englishman, who lived during the reign of King Henry VIII. Like Luther, Barnes was an Augustinian – though at Cambridge. 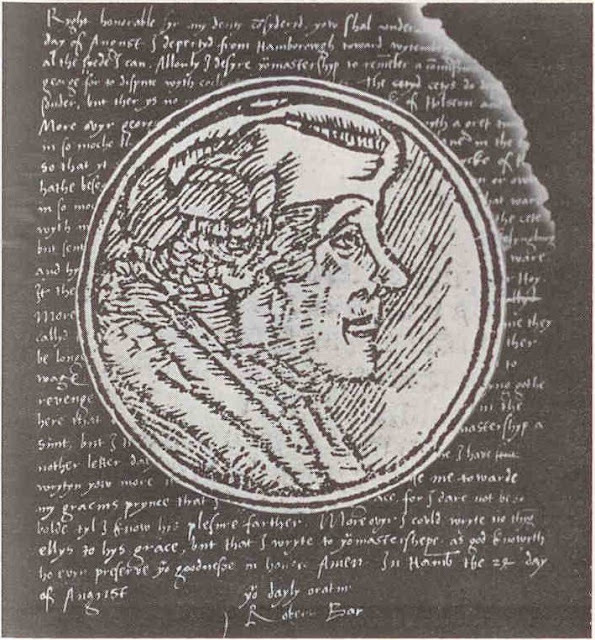 Following in the footsteps of Erasmus, he left Cambridge for the continent to acquire an education at Louvain, returning in 1523 with his Doctor of Divinity. Recognized for his scholarship, his order made him Prior of his house, a position he used to introduce the classical learning he had been exposed to at Louvain. Of course, knowledge of Luther and his theology was not hidden on the Cambridge campus, but, being Roman Catholic, such theology was officially forbidden and rejected. Knowing that it was being discussed anyway, at times the University even conducted searches for heretical books or pamphlets that may have made their way from Germany. For this reason, scholars often met off campus, to study the text of the Bible and discuss theology. One place they met was the White Horse Inn. Among the group who met there was Dr. Barnes, who was the indisputable leader of that group, Thomas Cranmer, who would later become Archbishop of Canterbury, and William Tyndale and Miles Coverdale – important Bible translators and publishers – along with many others who would later be referred to as the Cambridge Reformers. The insecurity of the Tudor crown. Because of the public scandal of the King’s marital incontinence, and the religious offense it created among Roman Catholics, many – consistent with their religious teaching – prophesied the King’s death or removal from the throne by divine means. Under Henry, such sentiments, if made known, were made punishable by death. Following this was Henry’s determination to force his subjects to accept his divorce from Queen Catherine. In a move to create political separation from Rome, parliament named the King as the “Only Supreme Head of the Church of England” – and Henry demanded that every subject in England recognize this fact. Such were the politically motivated reasons for opposing the Roman Catholic Church in England, for changing it to the liking of England’s leader. Roman opposition within England, what little of it there was, came mostly from churchmen: cardinals, bishops, monks, abbots, nuns, and leaders of state, like Sir Thomas Moore, were publicly executed, either by burning, hanging, beheading or some other gruesome means. Some were drawn and quartered. Of those executed by Henry VIII during this time, fifty were officially named as martyrs by the Roman Church. On the other hand, after Sir Thomas Moore had become Chancellor in 1529, there arose some concern that Protestantism, in addition to causing unwanted reform within the Church, may well cause political unrest as well – something which, again, amounted to a threat to the royal authority of the Tudor family. Prior to this, persecution of protestants was largely within the domain of the Church, and was nearly limited to laymen – mostly common laborers – who were unable to defend themselves against the charges of heresy. In fact, from the time of Wycliff (ca. 1380) up to this time, nearly 4/5 of all protestant martyrs were laymen. In 1529, Cardinal Wolsey, Chancellor of England since 1514, and the pope’s personal representative to the King since 1521, was dismissed from his position for failing to obtain permission from the pope for Henry to divorce his wife, Catherine. Sir Thomas Moore was appointed Chancellor in his place, and as Chancellor, set into motion policies for the execution of religious protestants – policies under which he himself was deprived of his Chancellorship in 1531, and finally executed in 1535, for refusing to recognize the King as Head of the Church, refusing to recognize his divorce from Catherine, and refusing to endorse England’s separation from Rome. By 1529, however, Dr. Barnes had already gotten himself into serious trouble under Wolesy. In 1525, the Cambridge Reformers agreed that Christmas would be the day that they would announce their allegiance to evangelical theology, and that Dr. Barnes would deliver that announcement in a sermon, from the pulpit of St. Edward’s Church – the chapel of Trinity Hall and Clare Colleges of Cambridge University. As a result, he was arrested, tried and imprisoned, but by 1528, had escaped, finding his way to the University of Wittenberg where he studied under Dr. Martin Luther, fully absorbing his theology, until 1531. In 1532, Thomas Cromwell, friend of the Reformation, was appointed Chancellor of England to replace Moore. He successfully orchestrated Henry’s divorce from Catherine. He also played a key role moving forward Henry’s ambitions to forge political alliance with the Lutheran Princes of Germany. As a result of the extended and embarrassing altercation with Rome over his divorce, Henry was eager to return the favor in a way that would deprive Rome of further political influence. Establishing political relations with the Lutherans was the expedient he required. About this time, Dr. Barnes, who was still in Germany, began writing. His first work was a theological sourcebook demonstrating his thorough acquaintance with, and commitment to, Lutheran theology. His second work was a book entitled, Supplication to Henry VIII. 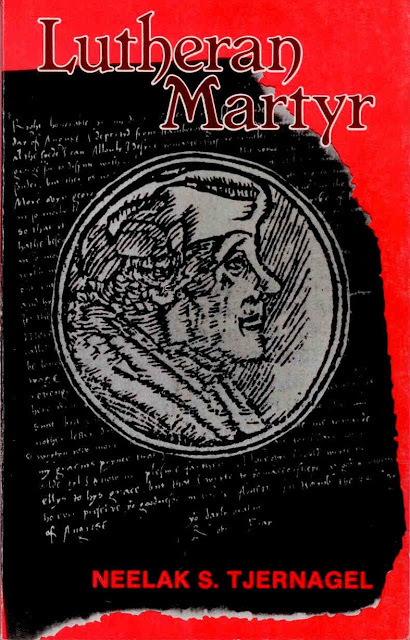 This work was a collection of essays, giving strong indication of his loyalty to the King, vindicating himself of the charges he faced under Wolsey, and defending Lutheran theology. This book found its way to King Henry, along with the Augsburg Confession and the writings of two of Barnes’ White Horse Inn colleagues, Tyndale and Frith. King Henry not only approved of Barnes’ writings, but urged that they all, by any means, be brought back to England. Frith returned, but upon examination was found to hold Zwinglian ideas, denying the Real Presence of Christ in the Eucharist. Refusing to recant, he was burned at the stake in 1533. Tyndale refused to return to England unless the English translation of the Scriptures be freely distributed to the King’s subjects. His request was refused, and so Tyndale remained in exile until his arrest in 1535 and execution a year later. Barnes, on the other hand, returned to England over the Winter of 1531-1532, under the King’s promise of safe conduct, and returned to Europe the following spring. Later in 1532, Thomas Cranmer, a Protestant and another one of Dr. Barnes’ associates from the White Horse Inn, was appointed Archbishop of Canterbury – an appointment secured by the family of the woman King Henry VIII wished to marry after his divorce from Catherine. Dr. Barnes was politically useful to King Henry – useful in his endeavor to achieve political independance from the Roman Catholic Church. Barnes' intimate relationships with the key figures of the German Reformation, and his thorough knowledge of their doctrine, would serve Henry as he sought political alliance with the Lutheran princes. Barnes was recalled to England in 1534, to enter the King's service, initially as a liaison to Germany, then as ambassador to the Lutherans of the Smalcaldic League, eventually securing in 1536 a theological formula which could serve as a basis for opening political relations with them. Barnes was rather positive regarding this formula. On the other hand, the Germans had also produced a decision regarding the divorce of King Henry, which was disapproving. This latter development cost Dr. Barnes his job, regardless of the formula he had returned with. The situation had changed, and the formula was no longer a priority: both Catherine and her replacement had died, eliminating the political issue of Henry’s divorce and remarriage. Thus, given that political priorities had changed, Henry was disposed to reject the formula Barnes and his fellow ambassadors had developed with the Germans, and assert England’s independence by writing his own document to secure religious unity and open political relations. His document was entitled The Ten Articles. Upon examination, Melanchthon declared that they must have been “composed in confusion.” By the end of 1536, Barnes was in prison again. In 1539, however, Charles V and Francis I found themselves on peaceful terms, forcing England to make some form of favorable political overature in order to avoid war. Therefore, sponsored by religious parties favoring the teachings of the pope, Parliament passed the Act of Six Articles, hoping to maintain open lines of communication with Rome. This Act affirmed transubstantiation, declared communion in both kinds unnecessary, forbade the marriage of priests and required that they take vows of chastity, required private masses for priests, and required the practice of private confession for all Christians. The Germans were stunned. “Luther cried out against the king who had deprived the pope of his name and property in England, but was perpetuating the pope’s doctrine and ‘abominations’” (Tjernagel, pg. 140). Yet, Henry did not enforce the Articles, reviving hope among the Germans and Henry’s ambassadors that alliance could yet be attained. And such appeared to be necessary. Fearing certain war with Charles and Francis, and desperate for an alliance in such a conflict, Henry not only renewed negotiations with the Germans and reached out to the Danes, but agreed to marry a relative of one of the German Princes. Barnes was not involved in these negotiations, but continued to preach, and by Lent of 1540, was appointed to a pulpit at St. Paul’s Cathedral in London. In this short time however, the fragile peace between France and Rome had disintegrated, once again eliminating Henry’s need for alliance with Germany. He ignored their overtures following the negotiations of the previous year, and sought divorce from his third wife, terminating any further hope of a political relationship with Germany. The failure of German negotiations resulted, by this time, in the veritable freefall of Chancellor Thomas Cromwell, as he was attacked mercilessly by Parliament for his inability to establish political relations with the Smalcald Lutherans. The Lenten season of 1540 was rather unkind to Dr. Barnes as well. He was attacked from the pulpits of Roman sympathizers in London, who pointed to the Lutheran "heresy" of Justification by Faith Alone which was openly preached by Barnes. He and his compatriots were arrested and imprisoned four months. On July 28, 1540, Thomas Cromwell was beheaded for, among other things, supporting the "heresies" of Dr. Robert Barnes. Two days later, however, something rather interesting happened – which brings us to where this brief history started: the opening pages of Tjernagel’s biography of Barnes. On 30 July 1540 six men, bound on hurdles, were drawn from the Tower of London to Smithfield market for execution. Two men (one a Roman Catholic, the other a Protestant), were tied to each hurdle for this melancholy progress. They were to die at a slaughter house dumping grounds, the customary site for the burning of heretics. Three of them were to be burned as heretics. The others were to be hanged, drawn and quartered for treason. Each of these men had strong religious convictions, yet their execution had no real religious significance. Purely political considerations had determined the identity of the victims and the time and manner of the executions. None of them had the martyr’s option of saving his life by renouncing his faith. All of them were sentenced to death by acts of attainder. [A] legal device... it permitted the English parliament to condemn and sentence without trial and without naming the charges on which the sentence was based. A religious coloring was given to the politically motivated executions on this occasion by the fact that all of the victims were university men and noted preachers. All had previously had some encounter with the authorities on religious issues. Contemporaries identified the three Catholics, Thomas Abel, Richard Fetherston and Edward Powell, as doctors of divinity... [of Oxford and Cambridge]... [They] had been defenders of Queen Catherine during the divorce proceedings... Powell had been given the highest praise by Oxford University for a book attacking Martin Luther. A short time before their deaths the three Protestant victims had been honored by Thomas Cranmer, the Archbishop of Canterbury, with an invitation to preach the Sunday sermons during Lent at Paul’s Cross, an open air pulpit at St. Paul’s cathedral in London. [These Protestants were William Jerome and Thomas Garrett, both of Oxford and Cambridge Universities, and] Robert Barnes, [who] had been educated at Cambridge and Louvain... He was prior of the Augustinian monastery in Cambridge and later served as chaplain to Henry VIII and as the king’s envoy in foreign diplomacy from 1531 to the time of his death. We now know that Dr. Barnes was the primary victim in the executions of 30 July 1540. His sentence was due to a political gesture made by king and parliament in that month. Garrett and Jerome went with him because they shared his views and were associated with him in the preaching of the Lenten Sunday Sermons at Paul’s Cross. The three Catholic theologians were sent to death on the insistence of the Protestant members of the King’s Council. They feared that the execution of three Protestants, condemned to death chiefly for political reasons, might be interpreted as a triumph of the Catholic party in the government. In other words, to maintain the appearance of impartiality, the King and his Parliament could not discipline members of one religious party, without also disciplining members of the opposing party. Too bad they were so consumed with managing appearances. Too bad that despite the obvious division about them, they were willing to satiate both religious parties in hopes of maintaining political harmony, even though it only perpetuated and entrenched the division. Who knows how history would have unfolded, had they actually been concerned with the Truth, with agreement and unity in principle, and with dealing transparently with others under it. Compromise never leads to peace, it only postpones conflict. Thank you for taking the time to research and then publish this very interesting, historical treatise. We are always held or condemned by our relation to Scripture without regard to time or convention.